Troubleshooting 16S PCR from A/C filters (or other annoying substrates) – microBEnet: the microbiology of the Built Environment network. One of our goals at microBEnet is to increase communication and collaboration between people working in the disparate fields that make up the “microbiology of the built environment”. Most of what we’ve posted about in the past relates to general information and events… but we’d also like to host more technical information that would help people doing the work on the ground. Yesterday our lab was having some troubles with DNA extractions from A/C filters and I e-mailed some questions to folks at the BioBE Center and got back this extremely helpful response from Adam Altrichter (@atrickster). Hey David — sounds like you’re having trouble with inhibitors! The good news is that if you’re extracting a dirty supernatant there’s a very good chance you should have DNA in that sample. Bad news is that the dirty-ness could be preventing you from getting any good, amplifiable DNA out of the sample. In general the power soil kits are pretty good at cleaning up samples, but not perfect. Make sure you’re using a positive control (something you know will amplify) in your PCR so that you know the PCR should have actually worked (i.e. you didn’t forget a reagent or something). 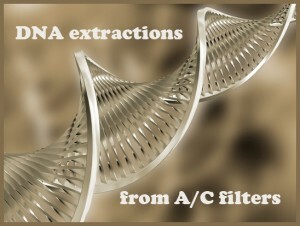 Try a dilution series on your DNA template (dilute in tris or water). 1:10, 1:100, 1:1000, even 1:10000 are not uncommon for soil samples. 4. James mentioned BSA (bovine serum albumin) — try adding BSA (0.1-0.8ug/uL) which can help in samples with high impurities. 5. Try running an annealing temperature gradient, starting lower than you might expect. 6. Run more cycles…anywhere 25-40 cycles. 7. Do an additional phenol:chloroform extract of the template to remove impurities. 8. You can try to make all sorts of tweaks to your PCR — changing MgCl2 levels, adding more/less template or Taq, adding DMSO or betaine in combination with BSA has been shown to help. – Then you can work with that liquid to extract instead of trying to extract straight from the bit of filter. If the solution is really dirty you should have plenty of DNA to work with. If it’s not, then you can try to concentrate it prior to adding to your extraction kit (you could try the Amicon ultra filter set up). Alternatively, you could add more buffer to your bead beating tube (use a bigger bead tube, like the ones that come with the PowerWater Mobio kits) to prevent the filter from sucking it all up. However, I think just having the chunk of filter in the tube could be preventing efficient lysis of cells during the bead beating step — especially if you’re doing this step in the little 2mL tubes from the power soil kits. Make sure the ‘dirty’ side of the filter is facing inward in the bead tube too if you’re rolling it up to fit in the tube. You could also try to do a quick freeze-thaw in liquid nitrogen of the filter in the bead tube to break it up a little bit before bead beating (just make sure you reheat the tube at ~65C for 10 min prior to bead beating to allow precipitants to go back into solution). @phylogenomics @atrickster recently tracked down bad contamination to BSA which was contaminated at source – mol biology grade, for PCR. @phylogenomics @atrickster varied from tube to tube in intensity, even within same lot – Sigma. @MikeyJ @phylogenomics wow, I just received a batch from NEB…we’ll see how clean it is.